The AA-7000 series' 3-D optical system is capable of producing maximum performance for both flame detection (Pb 0.015 ppm) and furnace detection (Pb 0.00005 ppm). This is achieved through optimal adjustment of the light beam and digital filter, and by using optical components that restrict light loss. The optical double-beam photometric system is automatically set for flame measurements, and the high-throughput, single-beam photometric system is automatically set for furnace measurements. With a new graphite furnace design, the AA-7000 Series has achieved improved lower limits of detection for furnace analysis in all fields, as compared to Shimadzu's previous series designs. The AA-7000 has the smallest footprint of any flame or furnace AA spectrophotometer on the market, combining flame and furnace system mounts in the same compartment. When combined with an optional auto atomizer changer, the AA-7000F creates an integral burner and furnace that remains permanently installed in the combustion chamber. It supports flame analysis of high-concentration samples and furnace analysis of trace samples without changing the atomizer unit. The AA-7000 series gives users a single high-performance autosampler for both flame and furnace, saving capital cost and set-up time. 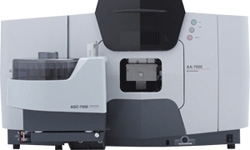 The ASC-7000 autosampler can layer a solution in the furnace like competitive systems, but takes analysis a step further by truly mixing a sample with four other solutions, such as matrix modifiers, matrix matching, dilution or standard addition samples, for a higher level of automation. Optimal background correction methods are installed as standard, and a high-speed self-reversal method provides correction over a 185 nm to 900 nm range. Additionally, because safety is an important consideration for flame atomic absorption spectrophotometers, the AA-7000 series are also the first instruments in the world to be equipped standard with a vibration sensor that extinguishes flames automatically. Other safety features include a multimode automatic gas leak check and automatic air-N2O switching for flame-specification instruments, and an argon gas pressure monitor and over-current protection unit for furnace-specification instruments.